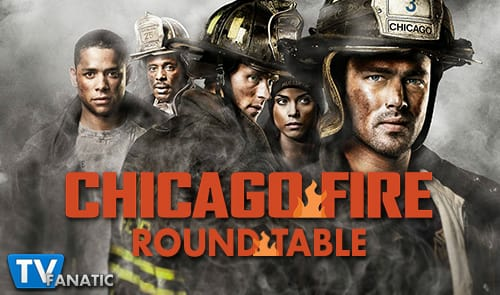 Chicago Fire Round Table: Has The Fire Gone Out On Dawsey? 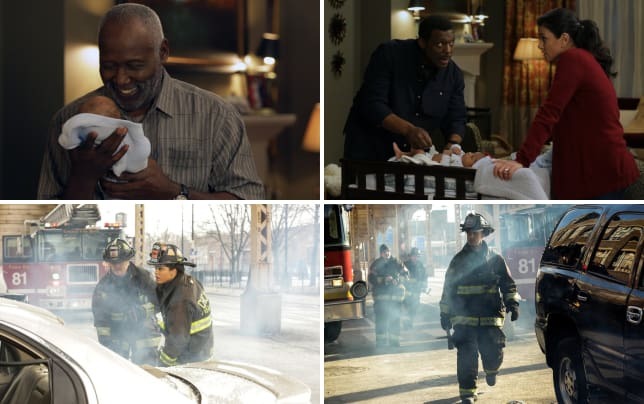 Several characters were in jeopardy on Chicago Fire Season 3 Episode 11, Dawsey had a kind-of breakup. What was your favorite quote or scene from the episode? Stacy: My favorite scene was Brett and Mills discussing whether or not to kill or save the guy on the table. It was intense and they both did a great job. My only complaint though was when Mills said he could save the guy, he should have negotiated letting Brett go first and then he'd save him rather than trusting him to let them both go. Mary Kate: All of the scenes with Mills and Brett with the kidnappers were high intense and drama-filled. The scene where Mills attacked the guys in the car was crazy. Even to see how they all escaped the car after the top was almost clear off was intense, not sure how realistic to escape with only one bad injury, but really intense nonetheless. Carissa: Seeing Herrmann's wife hanging with Boden and Donna. Herrmann's family is one in the truest sense of the word, so it makes perfect sense they'd be there for the Chief. Paul: My favorite scene has got to be the concluding one. I knew that we were going to get a cliffhanger because it was in the final five minutes. It was tense the way they opened the shutter and it revealed, but when we got to see the new clipping I was intrigued. How do you feel about Dawsey right about now? Stacy: I have felt for a few episodes now that I need a break from these two, so I'm glad the characters are doing that. I don't really see how it's not going to be super awkward at work, but they need to try something and if they think they can just be candidate and lieutenant it's worth a shot. Mary Kate: They probably do need a break from each other. I don't think either of them knows what they want at the moment, so a break could do them some good to get their priorities straight. I've noticed that Casey only has realized he screwed up after Dawson has already said her peace, even though Dawson ended things, I think it's Casey that needs to think about their relationship. Carissa: The same way I always felt about them. I never thought Casey was that into Dawson. He went from woman to woman too fast and it never gelled. Dawson deserves someone who isn't afraid to say what they think. For everyone wondering about putting the burden of the breakup onto Casey's shoulders, would you be as quick to open up to him if he overreacted to everything you said like he has done to Dawson for months? I wouldn't. He's like a china doll. Paul: Dawson has been a very problematic character for me. Sure, she is one of the shows better characters, but it’s the way she handles things that grate on my nerves. The way she acted was like something you’d expect from a CW soap. Brett contacting the crook she saved for help. React. Stacy: I figured when he gave her that card it would come up eventually. This seemed like a good time to use it. She really didn't ask for much if all she wanted was for Mills to get in to talk their captor. It's not like she asked him to put a hit out on the guy or anything. Mary Kate: To be honest, I actually thought the crook was the one responsible for their kidnapping, which would've been an cool twist. I feel like this story still isn't finished. For as an intense story as it was, everything ended a tad prettier than I thought it would. Carissa: How very Voight of her. Hey, if you have a contact and a lifeline in your pocket, use it. He's not going to turn her in. His question about whether she was using her card now makes me thing we haven't seen the last of him. I also don't think he'd force her to pay for another lifeline. Paul: I think i’m the only one getting negative vibes from her. The fact that she contacted him after being scared of him, is just downright weird. Obviously, I can respect that she wanted to help Mills out, but I thought she’d steer clear from the guy at all costs. How do you feel about the arsonist having a news clipping about Shay's death? Stacy: That was surprising and I'm definitely curious about it. I miss Shay and I'm still mad they killed her. Mary Kate: I feel that everyone is going to stop at nothing to get the arsonist, because they made it seem like he was responsible for the fire that killed Shay. 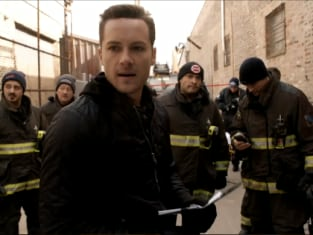 Severide will certainly make sure the arsonist is caught. Carissa: Well, it will give viewers closure if we can see the gang capture an arsonist. Someone needs to be held responsible for her death. I wonder if the CF writers added this story in after the reaction to yet another female killed on CF (a beloved one like Shay, no less) or if they had it in mind all along. Paul: This really set up the rest of the season really well. Even with Shay gone, she is still very much a part of the show. We are now 11 episodes past her untimely death, but she still in the storyline, which works for me. Make a prediction for the rest of the season. Stacy: I'm going to say Dawson and Casey stay separated for the rest of the season, or at least until the finale. I think they'll eventually get back together, but I would be annoyed if they worked this out by next week. Mary Kate: I think they are all going to want to focus on catching the arsonist for justice for Shay's death. Also, even though Dawson and Casey are apart now, I can see them finding a way back to each other and hopefully find a better way to work with each other. Carissa: Thing are going to get hot! Lots and lots of fires. I hear there are firemen on this show! At least one more crossover (as if we could keep CPD away) and no more deaths. Paul: Dawsey will stay apart before getting married in the season finale, or will some sort of disaster affect that? 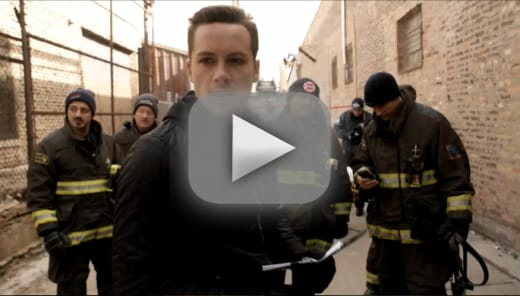 NOTE: Chicago Fire Season 3 Episode 12 will be titled "Ambush Predator" and will air on January 13. Chicago Fire Photos from "Ambush Predator"
Can't you guys tie off the bleed? Permalink: Can't you guys tie off the bleed? Where the hell have they been all this time? Permalink: Where the hell have they been all this time?